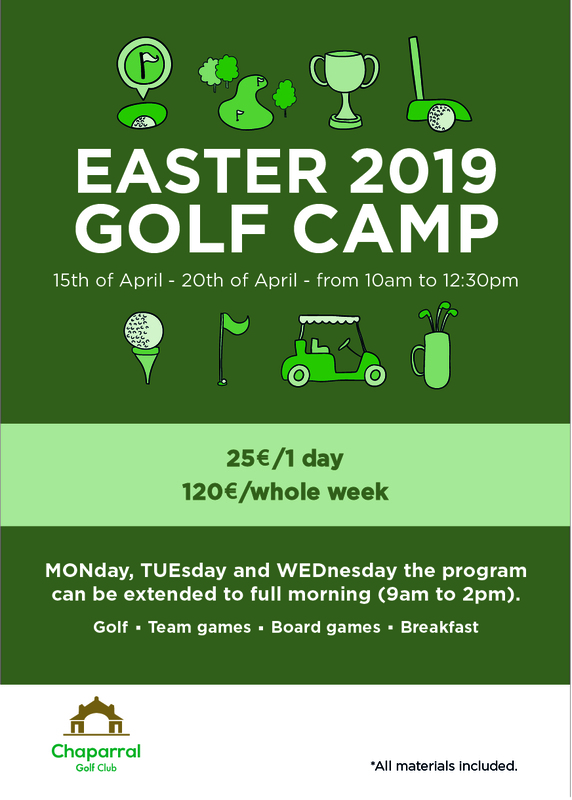 Easter Week Golf Camp 2019, Chaparral Golf Club, Costa del Sol. The children, from 6 to 14 years old, will be grouped by age and level of skills so we can guarantee the highest standards. The camp is designed to answer the demand of both total beginners and advanced players that would benefit from the knowledge and experience of Daniel and his team of coaches. Long game, short game, putting, course management and more will be covered in an environment oriented to their entertainment, education and athletic development. The week will finish with a tournament organized in different categories so players can put into practice all that has been learnt during the week. The week of training has a price of 120€ or 25€ for individual days. All materials, unlimited balls during the trainings, clubs for players that don’t own equipment, water, etc are all included in the price.